Amazingly nutritious, incredibly healthy, body alkalizing and mineral-rich natural food salts! 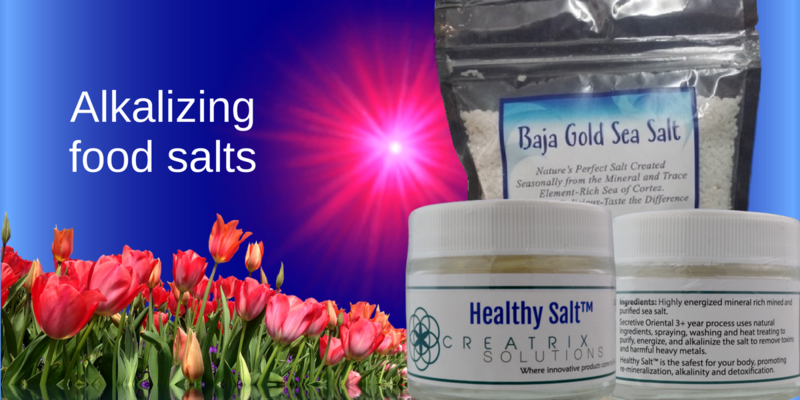 The tasty and body-friendly unrefined food salts from Baja Gold and Creatrix Solutions are both carefully crafted and minimally processed in order to retain the highest possible amounts of naturally occurring essential minerals and trace elements. Daily use of these types of alkalizing food salts, either in recipes or directly on food, help to nourish the body and contribute to a healthier and livelier you! Food Salts that Alkalize the Body: Daily food and beverage choices impact the body's ideal pH and mineral content. It takes 20 parts of alkalinity to neutralize 1 part of acidity in the body. Baja Gold sea salt was analyzed at an above neutral alkaline pH of 8.04 and the alkaline pH of Healthy Salt is 10.72! Alkaline pH levels this high are extremely therapeutic in equalizing the body by inching it back toward a more ideal and neutral pH level. Alkaline food salts are especially helpful after eating acidic foods like tomatoes and grains or drinking acidic beverages like coffee and soda. Food Salts High in Minerals and Trace Elements: Baja Gold Sea Salt has 53 minerals! 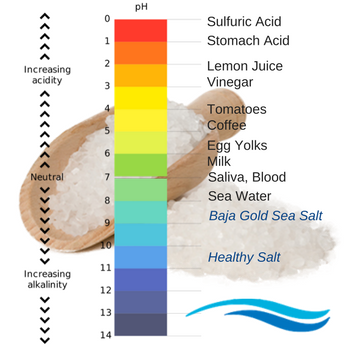 Healthy Salt has a confirmed 56 minerals, and is being tested to confirm trace amounts of up to 70 minerals in all! Either of these food salts are a far better choice than Himalayan Pink Salt.